One of the challenges with synthetic organic chemistry is the use of the many types of materials needed to make a chemical reaction work. These include starting materials, substrates (the substance being modified), and solvents (the substance in which material is dissolved), among others. Over time, the use of all of these materials can create a burden on the environment. Plus, there are also safety and economic concerns. 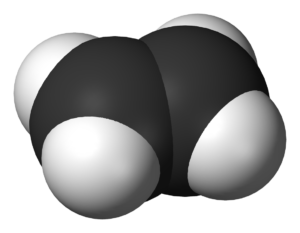 When it comes to solvents, water is an attractive option, particularly since most organic solvents are harmful (think benzene, toluene, and xylenes). Water is abundant and it doesn’t have any negative environmental side effects. Plus, it’s rather cost effective. 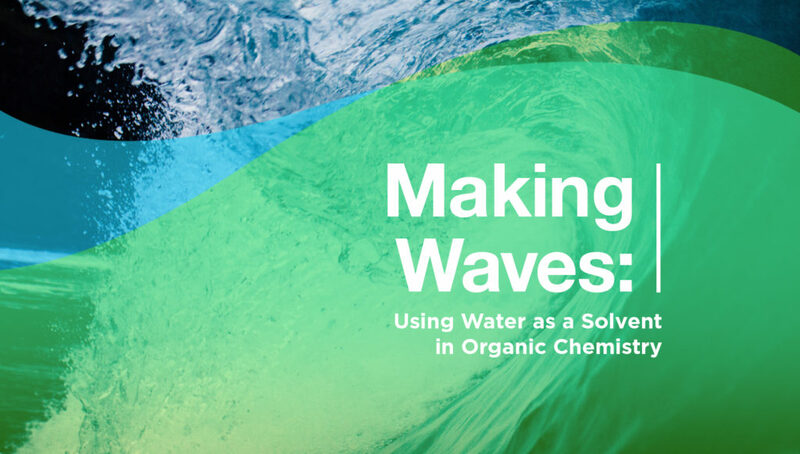 So although water might sound like a viable — and blatantly obvious — solution, there are drawbacks to using water within synthetic organic chemistry, the main one being solubility. One of the first lessons taught in every general chemistry class is the paradigm that like dissolves like. But when it comes to water and organic compounds, they’re like oil and vinegar: they never fully mix. In other words, organic compounds are not soluble in water. Put simply, some substances just don’t want to dissolve. In 2005, the Nobel Prize in chemistry was awarded to Yves Chaufin, Robert H. Grubbs, and Richard R. Schrock for the “development of the metathesis method in organic synthesis.” What these folks did was develop olefin metathesis, which is simply is a coupling reaction where you combine two alkenes (another word for olefins) to form one molecule. This development has huge — and wondrous — implications on the industry as a whole, especially when it comes to new materials. Aside from the solubility of metal catalysts in water, the only catalyst that you could potentially use in a water solution is the Grubbs catalyst, which doesn’t react with the air or moisture. The Schrock catalyst, on the other hand, is known for its sensitivities to moisture and air. Although this may seem to make Grubbs the viable candidate, if you try to run reactions in water with this catalyst, you’ll find it to be insoluble. So no-go there. There have been many attempts to modify the catalysts and or the substrates so that they can be used in water. But in order to effect those reactions, the materials must go through pretty significant modification, which can be done to either the starting material, the catalyst, or both. A year after the Nobel Prize was awarded to this trio, my grad-student self struck out to see if it was possible to actually run organic reactions using water as the solvent. I was particularly interested to see if it were possible to do olefin metathesis in water using unmodified substrates and catalysts that are actually not water soluble. And what do you know? I found that it was possible. And in 2008, we (along with my graduate advisor at the time) published a paper in the journal Organic Letters that describes results of this research. We conducted the olefin cross-metathesis with 20 or so unmodified starting materials and catalysts to show that it was possible to run olefin metathesis in water. And while we were able to run these reactions in water, the only change that was needed was adding a surfactant (a substance that lowers the surface tension between two liquids) to the mix to solubilize the whole thing. We were also able to effect ring-closing metathesis (in which a straight carbon chain is made ring-shaped) using the same type of chemistry, the Grubbs-type ruthenium catalyst, i.e., unmodified substrates and catalysts. Believing we could run these reactions in the presence of a surfactant is one thing, but actually doing so was another altogether. At that time, it was believed that the reaction was possible due to the fact that the surfactant would form a micelle in the water. (Micelles are pretty cool. They’re made up of little molecules that are like soap, in that they have a part that doesn’t like water and one that does — all in the same molecule. So when you place a micelle in water, they form little balls whose outsides contain the water-loving parts and whose insides contain the hydrophobic bits. Think of them like roly-poly bugs, with the feet being hydrophobic and the armadillo-like shield being the water-loving part.) My research colleagues and I believed that the reactions would form in the middle of these micelles, which were estimated to be about 22 nanometers wide. The significance of the project was that you could effect organic reactions in water using hydrophobic, or insoluble compounds, and do so without modifying any of the starting materials or the catalyst. The interesting part of the research is that it suggested that running organic reactions of unmodified substrates, even though they are insoluble in water, can effect those reactions in water simply by using a surfactant. If this technology matures, then it will be possible to run organic reactions at scale using the same technology, thereby eliminating some of the solvents that are used within the synthetic organic process. As a result, we’re just simply replacing them with water and a surfactant. That’s one of the potentials of this chemistry as it relates to green chemistry. It’s just one contribution to the field. If you’re interested in reading more about the micelle research, you can read the 2008 paper my colleagues and I published.